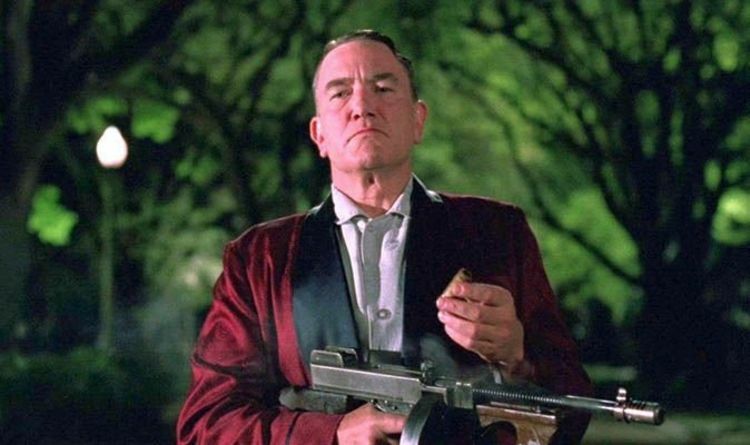 Finney played Irish mobster Leo O’Bannon during the Prohibition and in the famous Danny Boy scene of Miller’s Crossing he survives an assassination attempt. The scene opens with the famous song Danny Boy playing on a gramophone, as a couple of gangsters murder their way through Leo’s mansion. One corpse still has a lit cigarette in its hand, which starts a fire – one that will ultimately consume the house. Meanwhile, Finney’s Leo is relaxing on his bed with a cigar, when he notices smoke creeping up through the floorboards. As his would-be assassins march with their Tommy guns to his bedroom, Leo puts his slippers on and extinguishes his cigar. Taking his handgun and hiding under the bed he kills one of the men, before picking up his Tommy gun, throwing it out a window and jumping to the ground himself. Leo takes out another man in the window above with a hail of bullets before walking after an escaping car. He keeps firing until the car hits a tree and blow up in a huge gust of flames, as Leo gets ready to enjoy another cigar.